Scope mode, story mode, the P40 Heavy, and more. The latest screenshot update on Girls und Panzer: Master the Tankery shows scoping, story mode, the P40 Heavy Tank, and the limited box set’s final design. During battle, you can switch between normal mode, where you’re shown the outside of the tank in third-person, to scope mode, where you’re given a first person scope view from the tank’s cannon, allowing you to better determine your aim. The story mode screenshots show a snowy battle against the previous year champions, Pravda High School. While you’re piloting your tank, the girls will hold various conversations from the inside. 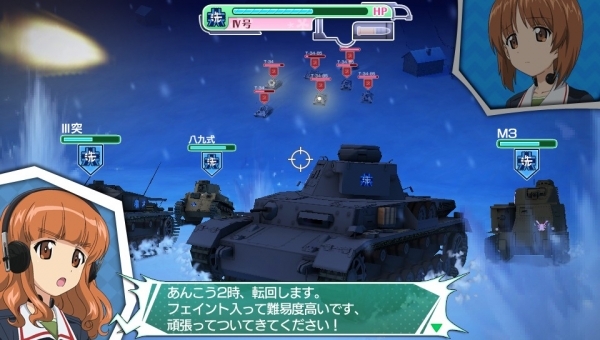 Girls und Panzer: Master the Tankery is due out for PS Vita on June 26 in Japan. View the screenshots at the gallery.